Please Note: while working with a client in my studio, I turn off my phone to ensure that there are no distractions. If you get my answering machine, I am sorry, but I will get back to you as soon as possible. We have both known and worked with Eileen for approximately seven years. During that time she has designed workout programs and worked with us as our personal trainer in helping us to maintain a healthy fitness regimen. 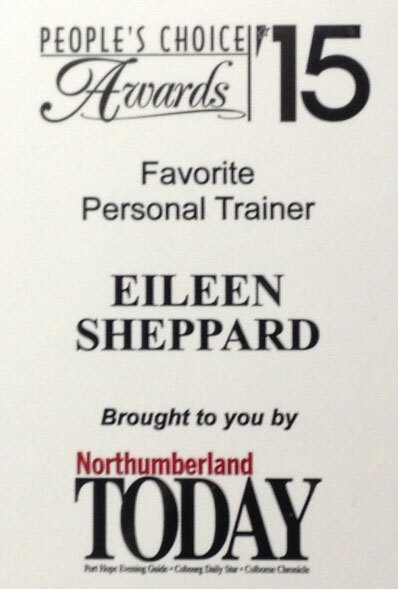 Eileen is fitness professional in every sense of the word and we value her contribution to our healthy lifestyle. Also, her pleasing personality has enhanced our working relationship to the point where we look always forward in anticipation to the next workout session. We have no hesitation in highly recommending Eileen and the skills that she brings to the gym as well as a resource for many issues surrounding healthy lifestyle living. I just have to say how in-tune you are as an instructor and as a person and this I find truly amazing. Your ability to perceive potential difficulties in a new move, the awareness of the class and individuals that are holding their breath or pulling their shoulders forward or turtling their shoulders and the constant breath cues are so helpful as I feel that my breathing seems to be out of sink and with your on-going cues it really helps me to focus on the other aspects of the movement. You know everyone’s weaknesses and you don’t call them that instead you figure out how to improve every one of us and if someone is injured you are there to help and support them and give them encouragement until they heal. I don’t know how you remember who has bad knees or sore shins it is wonderful. With the superb choice of music and constant hum of your voice I am able to relax. I know you are laughing at this point but for me “this is relaxed” unless I am hit on the head and unconscious, ha ha! Thanks for truly being an inspiration on what can be achieved by total commitment to health and in your genuine self.